You are a woman, and you should be proud of that. One of the theoretical tenets of the Soviet Union was that men and women are equal. Perhaps its no surprise, then, that Soviet women became the worlds first female combat bomber and fighter pilots. 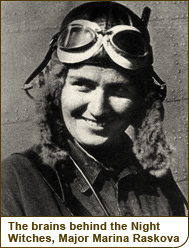 Theory aside, though, in practice it took major wartime setbacksPoland and Belarus had fallen, and male pilots were dying in drovesas well as direct intervention from leader Joseph Stalin before the USSR began accepting female aviation volunteers for the Great Patriotic War, aka World War II. In 1941, while the United States and the United Kingdom limited women supporting the war effort to noncombat roles, the Soviets were organizing three all-women fighting units. 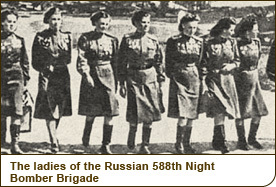 They were the 587th Womens Day Bomber Aviation Regiment, the 586th Fighter Aviation Regiment and, most famously, the 588th Night Bomber Brigade. Or, as the world came to know the latter, the Night Witches. The nicknameNachthexen in Germanwas bestowed by anxious enemy troops. Nacht means night, which is when the 588th flew; Hexen means witches, the Nazis closest reference point for women who fly and create mayhem. The Witches and the other regiments drew their members from the ranks of the USSRs extensive network of state-run aviation clubs. Before the war, flying was a growing fascination in the Soviet Union, cited as a priority by Stalin. By 1939, one-third of all Soviet pilots were female. Throughout the 1930s, teenage girls and boys joined, free of charge, quasi-militarized Communist Youth vocational programs. Female graduates became flight instructors or flew commercially for Aeroflot, the national airline. 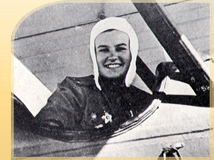 When Marina Raskova, a decorated hero of the Soviet Union and perhaps the most famous aviator in the nation, put out a call for female war volunteers, more than four hundred civilians answered the call. One young pilot wrote to Raskova that her 20-year-old brother, whod never kissed a girl, had been killed; her familys house, in occupied territory, had been seized and turned into a German police station; and even her apricot trees had been destroyed. The young woman was accepted as a Witch. Though the Witches enjoyed the same opportunities to do battle in the air as their male counterparts, they took to the skies in second-hand equipment. The Soviet women piloted Polikarpov Po-2s, vintage World War I biplanes that were essentially firetraps and swathed in radar-elusive canvasnot much sturdier than a witchs broomstick. Labeled The Flying Desks, the boxy aircraft were only intended to be used as training planes because they would easily ignite when hit by enemy fire. The women did their best, of course, to avoid being hit. The Witches planes were highly maneuverable, but as plodding as wartime peace talks. Because the110-horsepower Po-2s could fly only a hundred miles per hour, stealth was essential. The Witches used the lightweight planes as gliders, shutting off their engines and coasting silently towards targets. Whenever possible, the women flew close to the ground to further evade detection. And, because theres nothing like hitting the town (or enemies, for that matter) with your girlfriends, Witches attacked in tight, three-plane formations. Teamwork was key to their successful offense: Two of the aircraft would split off and create a diversion, with the third gliding through to deliver its payloadtwo to eight bombs that together yielded less than one ton of explosives. They fought in the occupied Don region of Russia, as well as the Crimea, Belarus and Poland. The mission of the Night Witches was more or less to keep German soldiers awake. The Witches relatively minimal payloads wouldnt directly win the war, but the constant overnight harassment of troops hoping to catch some sleep was designed to take a long-term toll. 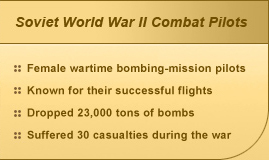 During 1,100 nights of combat, the Witches flew 24,000 sorties and dropped 23,000 tons of ordnance. In addition to bombing enemy camps, they hit bridges and ammunition depots. But they didnt entirely evade casualties. In a war in which 50 million people perished, friends' deaths were a constant specter. Thirty Witches perishedpilots, navigators and ground supports (the mechanics and armor makers were females, too). There were occasions, one Night Witch officer recalled, when I saw our planes shot down and on fire, and I could look at [my] map and calculate who it was burning in the air. The Night Witches are still marginally remembered today, a few joining in the retinue at annual Russian May Day parades. Meanwhile, the world is witnessing more women than ever answering the call to fight for their countries and hit the battlefields. Canada and Scandinavian nations such as Norway and Denmark permit women in combat roles. NATOs female troops increased tenfold from 1961 to 2001. Women and girl soldiers are common throughout the developing world. About 14 percent of the U.S. military is female. And, in 1993, the U.S. Department of Defense directed the military to permit women to serve as combat pilots. 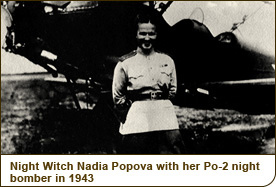 Five decades prior, the Night Witches were flying pioneers. These women flew high, and sometimes fell, for their homeland. They were trailblazers in war, the cruelest of human endeavors. A proud and brave group of soldiers, the Night Witches demonstrated great skill in the air (and great friendship to one another), engaging in battle and putting their lives on the line to servejust like their fellow countrymen. The skies were forever changed by these nocturnal warriors and their courageous flights. Like Rosie the Riveter in wartime America, Night Witches demonstrated the importance of women in supporting the war effort. International media filed stories and published photos of the daring young Soviet women clad in their blue uniforms or standard-issue flight gearbrown leather jackets, fur-lined caps and bug-eyed goggles. Their closest contemporary American counterparts were called WASP, or Women Airforce Service Pilots. These ladies played support roles, ferrying planes from American factories to military bases, but they never fought in combat. Even Witches were expected to dress like ladies. Once, to reward his troops, a visiting male commander requested high heels, skirts and coats for the regiment. Also, some of the women used blue threads culled from their underwear to embroider flowers onto their socks. The legend of the Night Witches grew so far and wide that a British soldier sent an offer of marriage to one of the Soviets. She declined. Crews returned from their night runs to eat breakfast and drink three-ounce rations of vodka. Twenty-three Night Witches were awarded Hero of the Soviet Union medals, the nations highest award of valor. A true sisterhood of warriors, the Witches established a bond that still lives on: Every year since 1945, the surviving members of the womens units get together in a park outside of the Bolshoi Ballet Theater in Moscow.